The 7 Pillars of Organizational Change Management to Achieve ServiceNow Wins is a practical, how-to guidebook for developing and using OCM strategies to achieve lasting digital transformation. Readers will learn how to initiate change, engage optimally with employees, navigate roadblocks to change, and measure the effectiveness of change. At the end of each chapter are key takeaways that can be used as talking points with colleagues to help spark successful ServiceNow OCM across the organization. Enjoy! If you would like to get free printed copies of all four books in the series, request a Pillars of ServiceNow Success Kit today! For bulk orders, please send an email to pillars@crossfuze.com. 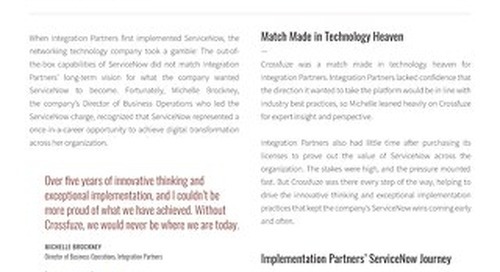 Crossfuze Smart Essentials outlines key steps (from experts who have been there and lived to share the learnings) to achieving your services vision. 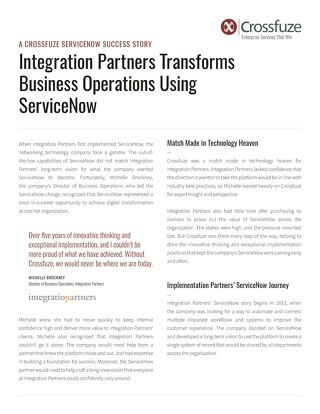 Unlock the secrets of platform success from over 500 ServiceNow implementations by reading the 10 Pillars of ServiceNow Success for CIOs eBook.